The walk 1000 miles challenge from Country Walking sounds like a fun idea. 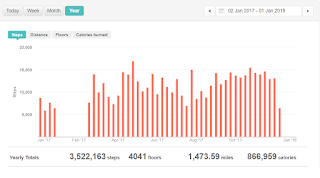 I use a step tracker (Fitbit Charge 2) and know I walk about 4 miles a day which is more than 1000 miles a year during my normal routine. 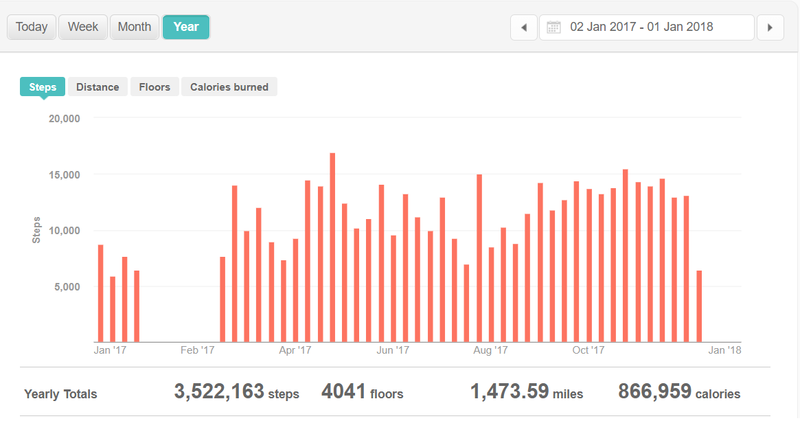 How many steps could I do with additional walks? My original FitBit stopped working last year which is why there are no steps between the end of January and February. I found I missed tracking my steps and bought the FitBit Charge 2 as a replacement. It counts your heart rate too which I find fascinating. Last year, I read Wild by Cheryl Strayed about the Pacific Crest Trail and The Journey Inbetween by Keith Foskett about El Campino De Santodiago. Both books detail long endurance walks but they certainly don't romanticise it. Despite reading them and thinking I'd never do that they've stayed with me and I've since found myself with several UK trail walk guides open in various tabs on my computer. 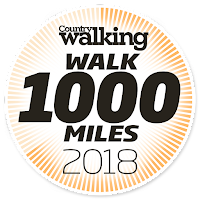 This was when I came across the Walk 1000 Miles Challenge and discovered that there are badges. As a former Brownie and Girl Guiding Leader I have a camp blanket full of fabric reward badges. I was intrigued to discover similar badges are awarded for walking feats. Lured by a combination badges, endurance reading and a desire to get a bit fitter I decided to go for it. I've also found myself coming up with dehydrated camping meal recipes in my head and did I mention there's a trans Canada trail too. The crux of the matter is I don't enjoy hill walking. I could ramble on the flat for hours but hills make me hot and irritable. I tried to figure out why this was and how I could then overcome it. I think the irritation rises up from frustration, frustration that a hill can beat me, that I tire quickly. And there's only one way to over come that. practice, improve, get better.